Russian retirees are finding a new life and new homes in warmer climates. Among the Russian tourists scrambling to leave Tunisia on Jan.16 were many senior citizens, looking annoyed because the government coup had disrupted their vacation. 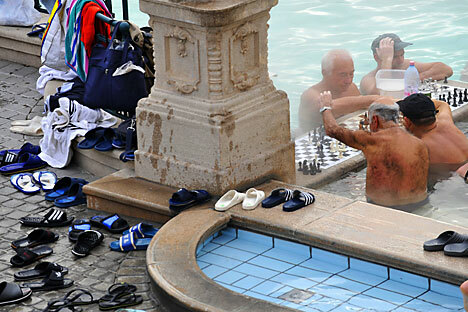 More and more Russian pensioners are taking advantage of the opportunity to go abroad for the winter—or longer. Russian retirees only started going south for the winter around 2000. It turned out to be not only pleasant, but also cheap. A three-month sojourn in Tunisia costs pensioners 65,000 rubles ($2,200). “A holiday for elderly people costs about 700 rubles ($23.50) a day, compared to 1,200 rubles ($40) at some seedy holiday club outside Moscow,” said Alexander Orlovsky, whose travel company has been offering older people winter trips to Tunisia for the past two years. “And it is a different kind of life to boot.” In Tunisia, pensioners see the sites, breathe the sea air and improve their health, while at home they would be sitting in their apartments, venturing out onto the slippery streets only when they needed to buy a loaf of bread. Last winter, Orlovsky’s firm sent more than 500 people between the ages of 60 and 85 to Tunisia. Those who are taking advantage of the chance to winter abroad come from all walks of life and have different levels of income, but they all share a desire to indulge themselves in their old age. The list of popular places to go includes Turkey, Montenegro, Bulgaria, Spain, Greece, France, Italy and Cyprus as well as Tunisia. Travel agencies are able to offer elderly people low prices in decent hotels abroad because they work with a special program for older people. Everyone wins: The program guarantees hotels clients in the off-season while travel agencies expand their clientele and pensioners relax and improve their health in comfort. Orlovsky admits that he has borrowed the idea of “snowbirding” from his Western colleagues. Tunisian hotels have long been offering special rates to leading European tour operators. It took a while for Russian pensioners to warm up to the idea, because of financial constraints. However, changes in the Russian real estate market made it possible for older people to take advantage of these travel opportunities. Larissa Petrova, a 57-year old Muscovite, headed for Goa as soon as she retired. “I had always dreamed of going there, but a teacher’s salary is too small to pay for travel, and then I had to help my daughter through university,” Petrova said. “Now I have rented out my flat and, over the last two years, I have spent periods in Goa, Turkey and Montenegro. I am a teacher of English, so I never have problems with language, and renting a house abroad is easy.” Petrova plans to go on a long tour of Europe, to live in France, Spain and Italy, before returning to Moscow to care for her grandchildren. Petrova is a typical representative of the new generation of pensioners, those who have worked a large part of their career in the post-Soviet era. They are better off financially, have experience traveling abroad and differ strikingly from the old women who used to sit on benches near the entrances to apartment blocks. The new pensioners are computer-savvy, bank online and can run their affairs remotely. The most remarkable thing is that life in some other countries is cheaper. “Russia is becoming an expensive country,” Mkrtchian said. “In the 1990s, pensioners did not go abroad because the prices of holidays and housing were higher there than here. Now the situation has reversed. Living and vacationing abroad is cheaper.” Besides, wherever a pensioner lives, he or she is entitled to his legitimate pension, which can be transferred abroad in foreign currency at the Central Bank exchange rate. Some countries, including Bulgaria, Portugal and Uruguay, also have special programs for foreign retirees so they can live comfortably even if they have no relatives locally. The pension plans in various countries offer low hotel prices, discounts for renting apartments in the off-season, quality healthcare and simplified steps to obtain a residence permit. The Turista Pensionado program in Panama offers a 20-year property tax exemption; a 5 percent discount for air tickets, hotel and holiday resort services, popular restaurants, cinemas, theatres and sporting events;and a 25 percent discount on utilities. Healthcare is 20 percent cheaper for seniors than for other population groups. After spending a couple of winters abroad, some pensioners decide to make a permanent move, and this decision has turned out for many to be fairly easy. Yelena Degteva, a pensioner from Kaluga, has been living in the Turkish town of Mahmutlar close to the popular Antalya holiday resort for six months. She does not worry about her pension back in Russia, which is accumulating in her account. At 63, Yelena became a downshifter: Abroad she lives on the $600 a month she gets from renting out her flat in Kaluga. “Six months ago, I sold my country house and bought a flat in Marmutlar,” said Degteva. “All my neighbours are Turkish, so I am gradually learning their language. I can already get by in everyday life.” Degteva is not going to emigrate, but she is also not planning to return to Russia any time soon. She has a guest visa, which costs her $400 a year. “Living here has given me a new zest for life,” she said. “Besides, in Turkey I can live on $600 and have everything I need; in Russia you cannot live normally on that amount.” If you throw in the sea, the mild climate, and excellent food, the pensioner’s choice makes sense. This is an abridged version of the original text.